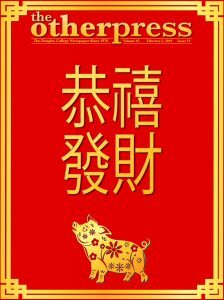 Home FEATURE	What is Chinese New Year all about? As with many things in my life that highlight the interplay between my cultural heritage and my nebulous understanding of social customs, I’ve long felt that I don’t quite get Chinese New Year. My family, first-generation immigrants from Hong Kong, has never been too huge on celebrations or traditions of any ilk. Still, we did observe the New Year more when my brother and I were younger; we’d watch the parade in Chinatown, be appropriately awed at the lion dances and firecrackers, and soak up the atmosphere within the lavishly decorated malls in Richmond. As a kid, the New Year felt like more of a Big Deal for my family, the same way that Christmas and birthdays were a Big Deal. Nowadays it’s little more than a suggestion to maybe get together for a family meal, if us busy adults can align our schedules around it. Over the years the importance of the New Year seems to have slowly faded, along with all of my childhood delight at all colourful festivities. Yet this Lunar New Year will be my zodiac year—which feels like it should be more of a Big Deal. The Year of the Pig starts on February 5 and will mark my two full zodiac cycles on this planet. I feel like this year of all years should matter, and that I should understand why it does. When is the New Year? Many cultures in East Asia and other parts of the world celebrate the Lunar New Year. However, I’m focusing on Chinese New Year and the traditional Chinese calendar because it’s probably the most familiar Lunar New Year to many people outside of East Asia—and to my own family. To understand the origins of this holiday, I thus turned to my most infallible source of knowledge: My mother Irene Wu, who grew up in Hong Kong and came to Canada in 1995. When the Chinese calendar was developed thousands of years ago, she explained, China’s economy was largely based on agriculture. The calendar was used as a guideline for farming—when to sow, when to plow, and when to expect rain. The New Year, also called the Spring Festival, signalled the start of spring and the resumption of farming activities. The traditional calendar is lunisolar, meaning it is based on both the phases of the moon and the position of the sun. Months are tied to lunar cycles, so each month begins on a new moon and is either 29 or 30 days long. A typical year has 12 months, but since this totals to 354 days, every second or third year contains an extra month to keep the calendar aligned to the solar year. China nowadays uses the Gregorian calendar for most purposes. However, the traditional calendar is still used for many holidays that harken back to China’s agrarian roots, including the Mid-Autumn Festival and, of course, Chinese New Year. The first day of the New Year takes place on either the second or third new moon after the winter solstice, depending on whether the year contains an extra month or not, which is why Chinese New Year falls anywhere between January 21 and February 20 on the Gregorian Calendar. The Chinese Zodiac follows a 12-year cycle, with every year corresponding to a different animal. In order, they are: Rat, Ox, Tiger, Rabbit, Dragon, Snake, Horse, Goat, Monkey, Rooster, Dog, and Pig. Legend goes that the zodiac order arose from a race called by the Jade Emperor, who decreed that the first 12 animals to complete the race would make it into the zodiac. Many slightly different variants of this myth exist but in most versions the Rat wins the race through either cleverness or trickery—and Pig comes last because it stops partway through the contest to have a snack and fall asleep. In addition to the zodiac, each year in the Chinese calendar is also matched with one of the five elements in traditional Chinese belief: Metal (or Gold), Wood, Water, Fire, and Earth. The whole cycle of animals and elements actually follows a 60-year rotation. The element for this coming year is Earth. 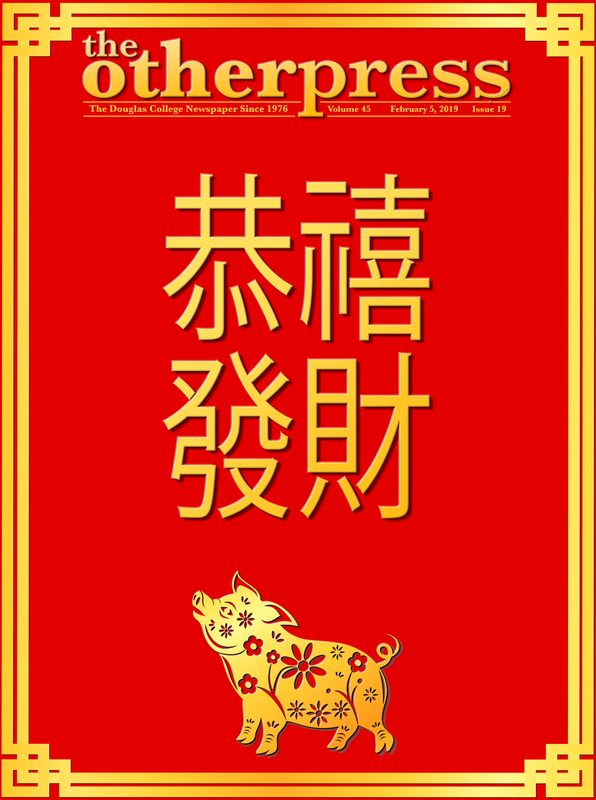 According to traditional astrology, people born in the Year of the Pig are supposedly peaceful, honest, and generous, though also prone to laziness, gullibility, and materialism. Earth pigs are also thought to be particularly sociable and skilled with interpersonal relationships. The legend of the New Year, Wu said, tells of a ferocious beast called the Lin (Nian in Mandarin; the same word for “year”) who came down to steal villagers’ livestock every New Year’s Day. However, the villagers found that the beast was scared of loud noises and the colour red, so they used drums, firecrackers, and red clothes and decorations to scare the creature away. Hence, every Chinese New Year these symbols continue to play a huge part in the celebrations. The Other Press’ Production Assistant Meghan Lin, whose parents both immigrated from Taiwan, calls Chinese New Year her favourite holiday for a variety of reasons, including the huge family gatherings, food, and festivities. There’s also a heap of superstitions around the holiday and what you should and shouldn’t do to influence your prosperity for the coming year, such as certain foods that should only be eaten around this time. Partly due to geography, partly due to the passage of time, however, Wu said she feels that celebrations of the holiday have changed from what she experienced growing up. In Hong Kong, the first three days of the New Year are national statutory holidays. Yet today, many commercial activities continue during this period—much like the increasing number of stores that remain open during Thanksgiving and Christmas in North America. Nor does the food itself hold the impact it once did, she said, since many peoples’ diets are very different from their historical consumption patterns. Humble agricultural essence or not, the event is still clearly a massive celebration for many in Asia as well as in immigrant communities overseas. Every year, the period of time around the New Year is the largest human migration in the world. This year, according to CNN, the Chinese government expects almost three billion trips to be made between late January and the start of March as people travel to visit their families. Lin said she feels that, having grown up immersed in the East Asian community, the significance of the holiday here is just as strong as anywhere else. “I don’t think my perception of [Chinese New Year] is different simply because I’m second generation […] I think the biggest aspect that might differentiate my perception from my parents’ is the fact that this does help me reinforce my identity as an Asian-Canadian when I walk the streets and see all these morsels of festiveness at the very end of winter,” said Lin. As for my family? For us, I guess it is “just a holiday”—but for us comfortably non-festive folks, that’s special enough.